Cover Story: What went wrong at TH? A turnaround plan for Lembaga Tabung Haji (TH) is likely to be unveiled as soon as Monday, Dec 10, in parliament by the minister in charge of the pilgrim fund, sources say. TH falls under the jurisdiction of Minister in the Prime Minister’s Department in charge of religious affairs Datuk Seri Mujahid Yusof Rawa. “TH’s 2017 accounts are expected to be tabled in parliament on Monday, and a turnaround plan will likely be announced then too,” a source familiar with the matter tells The Edge. The plan is likely to involve a special-purpose vehicle (SPV) taking over TH’s underperforming assets at book value, The Edge Financial Daily reported last Wednesday. 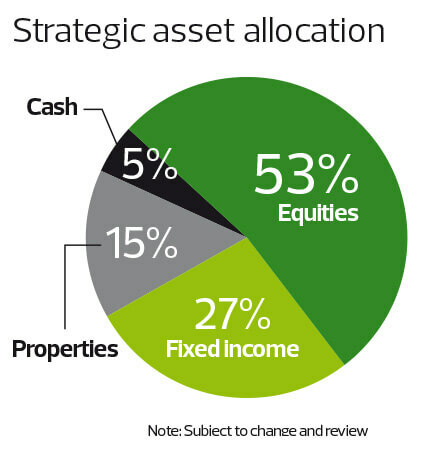 It is understood that the SPV will issue sukuk to raise the cash to acquire the underperforming assets from TH. It will then, over a period of time, work to recover the value of those assets. This is akin to what Pengurusan Danaharta Nasional Bhd did when it took over the non-performing loans of banks after the 1997/98 Asian financial crisis. Events in the last two weeks would have left Malaysians — Muslims, in particular — in a state of dismay to learn that TH’s financial position does warrant concern, as flagged by certain stakeholders in 2015. Those who spoke up then, including PKR politician Rafizi Ramli and the then Bank Negara Malaysia governor Tan Sri Zeti Akhtar Aziz, had their claims rubbished by TH’s former CEOs. According to sources, TH inflated its profits in the last few years to justify paying dividends to contributors. Under its new leadership since mid-July, TH lodged two police reports on Nov 30 against former chairman Datuk Seri Abdul Azeez Abdul Rahim, former CEOs Tan Sri Ismee Ismail and Datuk Seri Johan Abdullah, as well as four senior management staff over misuse of funds and wrongful conduct in a corporate deal (see accompanying story). It is learnt that the four senior management staff members — Datuk Adi Azuan (chief operating officer), Datuk Rozaida Omar (chief financial officer), Hazlina Mohd Halid (legal adviser) and Rifina Md Ariff (senior general manager of corporate services and real estate) — have been placed on gardening leave. Last Tuesday, the 2017 Auditor-General’s Report revealed that TH failed to record an impairment totalling RM227.81 million in three subsidiary companies and three associate companies, primarily in associate company TH Heavy Engineering Bhd amounting to RM164.58 million. TH’s new CEO, Datuk Seri Zukri Samat, has come out to assure depositors that their savings are safe. “It is business as usual for us. Our depositors should trust that TH will ensure their deposits are secure,” he told Bernama on Dec 2. Zukri, the former CEO of Bank Islam Malaysia Bhd, could not immediately be reached for comment for this story. He was put in the driving seat on July 13, the same day that former banker and Securities Commission Malaysia chairman Tan Sri Mohd Nor Yusof was named chairman. This was after the resignations of Abdul Azeez and senior board members Tan Sri Irwan Serigar Abdullah and Tan Sri Mohd Apandi Ali. Datuk Zaiton Mohd Hassan, an accountant and founding CEO of Malaysian Rating Corp, and retired attorney-general Tan Sri Abu Talib Othman joined the board in August. In the coming weeks, there will likely be more revelations of wrongdoing as the new team at TH continues with its internal probe into past transactions. It is learnt that TH will likely undertake a valuation of its properties abroad, which are mainly in the UK and Mecca, to gauge if the prices it paid for them were justified. So, how did things go so wrong for an institution that was created 55 years ago with the noblest of intentions? It is clear now that its problems stem from lack of proper regulatory oversight. TH was set up by the government in 1963 to facilitate the Muslim community’s savings for their pilgrimage to Mecca. Eventually, it came to handle all their travel arrangements too. TH was a means for Muslims to not only save but also invest profitably in accordance with Islamic principles. As it stands, TH is governed only by the Tabung Haji Act 1995. Bank Negara has no regulatory oversight of the deposit-taking financial institution that invests in equities, bonds and property at home and abroad. It is time for that to change. The Edge understand that TH’s turnaround plan will include a separation of its deposit-taking business from that of pilgrim management. Sources say TH’s new management wants deposit-taking to become a regulated business under Bank Negara, much like banks. When TH started operations in 1963, it had 1,281 depositors with total savings of RM46,610. At the time, dividends and bonuses were not part of the plan. 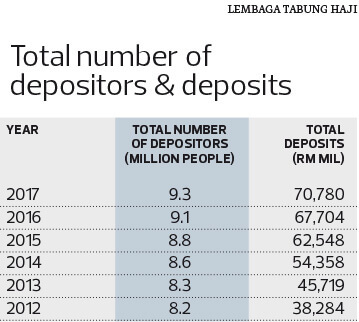 Today, TH has just over nine million depositors with savings of more than RM73 billion, and depositors have become accustomed to receiving high annual “hibah” or dividends. It has become too big a financial institution to be merely governed by the Tabung Haji Act. Without independent oversight, TH’s massive funds are open to abuse. TH should come under Bank Negara for two main reasons. One, the regulator would ensure, as it does for banks, that TH has fit and proper directors on its board. Its previous board included the country’s Treasury secretary-general and attorney-general of the time — Irwan Serigar and Tan Sri Mohd Apandi Ali respectively — while chairman Abdul Azeez was an active politician, raising questions about the independence of the board’s decisions. Irwan Serigar was also on the board of at least 20 government entities and government-linked companies, casting serious doubts on his focus. Two, it would ensure there was a proper risk management framework. This is important as TH needs to not only get back on track but also stay on a strong path even after its current caretakers’ terms are up. Sustainability of the institution is key. Interestingly, it was Zeti’s father, Royal Professor Ungku Abdul Aziz Abdul Hamid, who was instrumental in TH’s creation. A reputed academician and an authority on the rural economy, he had noticed that Muslims were saving money in pillows and under mattresses, or selling land and livestock in order to meet an innate desire to perform the haj. Worried that these traditional savings methods were detrimental to the rural economy and to national economic development, he suggested a pilgrims savings corporation. Decades on, in December 2015, amid rumblings that all was not well at the fund, Zeti, the then Bank Negara governor, issued a letter, warning TH that it needed to strengthen its risk management after a routine check uncovered that it had more liabilities than assets. Zeti told the then TH chairman Abdul Azeez that it had only 98 sen in assets for every ringgit of liabilities. In a separate letter to the then Minister in the Prime Minister’s Department Datuk Seri Jamil Khir Baharom, Zeti warned that TH’s finances could have a financial impact on the government because its deposits were fully guaranteed by the latter. Zeti had expressed concern that TH had been paying higher dividends than it could afford since 2012. But because Bank Negara had no regulatory authority over Tabung Haji, its warnings were ignored. 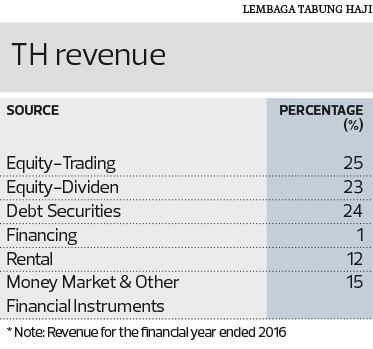 TH is believed to now have around 80 sen in assets for every ringgit of liabilities. The turnaround plan involving the SPV will enable TH to close the gap between its assets and liabilities. Section 22 of the Tabung Haji Act states that it cannot pay dividends and bonuses to its contributors if its assets are worth less than its liabilities or if it is not profitable. Yet, under its previous management, TH continued paying dividends in the past few years. “To get TH back on track, it needs to make the assets at least equal to the liabilities, so it can pay dividends,” a source told The Edge Financial Daily last week. 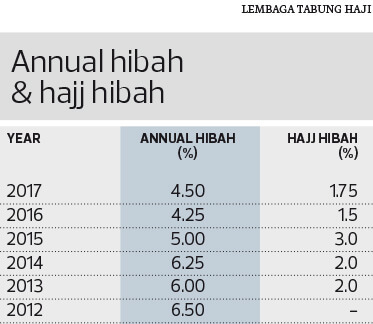 Earlier in February, TH declared a dividend of 4.25% to its depositors and an additional 1.5% to those yet to perform the haj for its financial year 2017 (FY2017), just ahead of the May 9 general election. However, it had yet to release its FY2017 accounts. Going by the names TH singled out in its police reports, it is clear that the institution wants not just the former top brass but also senior staff members to be culpable of the purported wrongdoings. This is rare and a test case for Malaysia under the Pakatan Harapan government. Recall that Pakatan Harapan had promised in its GE14 manifesto that it would take firm and quick action to uncover wrongdoings at government institutions, such as 1MDB, FELDA and TH if it came to power. It is learnt that just over 1% of Lembaga Tabung Haji’s nine million-odd depositors own a big portion — possibly almost half, say sources — of the RM73 billion it manages for them. This little-known statistic is interesting as it is an indication that the rich have been parking big sums of money at the pilgrim fund to take advantage of its generous annual dividends over the years. It is also a safe investment as it is understood that deposits are fully guaranteed by the government. However, this heavily lopsided exposure to a small number of contributors is risky for TH. There is the question of who the government should protect — the contributor who is investing to make the pilgrimage to Mecca or the rich looking for consistently good returns? Other government-owned entities have limits as to how much an individual can invest. Permodalan Nasional Bhd has a RM200,000 limit for investors of its funds. At the Employees Provident Fund, the amount members can voluntarily contribute is capped at RM60,000 a year for each savings account. It is something the government should look into for TH as well, lest it becomes a “rich man’s tabung”, so to speak.